Central City / Parallel 49 2015 Craft Crossing Calendar Day #23 – Vow of Silence Whiskey Barrel Aged | Justintoxicated. -The home stretch! 2nd last beer until I’m finally done with the 2015 calendar. And then back in time to finish the 2014 one. Visual: Pours translucent light copper brown without a significant head, very thin layer of micro retention, lots of steady streams. Finish: acidic tangy, mildly pukey, off-dry woody sour finish. 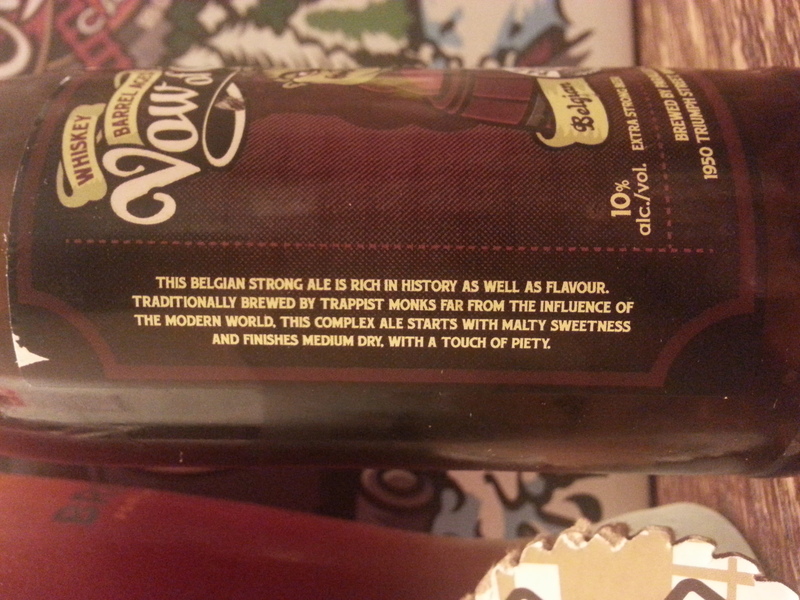 Summary: Quite an odd flavour profile for a Belgian Strong – it kinda works, but the sourness is somewhat overbearing. ABV is well-hidden but I’m not sold on the flavour and acidity.